The EFEO Center in Siem Reap has been for over a century a major actor in the restoration of the Angkor monuments and the development of Khmer studies. It was in 1907 that the EFEO was charged with the inventorying and preservation of the Angkor site. In order to safeguard the many temples scattered through some 400 km2 of forest, the EFEO established a permanent branch named the Angkor Conservation. This institution was attached to the Cambodian Ministry of Culture after independence in 1952 but remained under EFEO control until the Khmer Rouge took power in 1975. 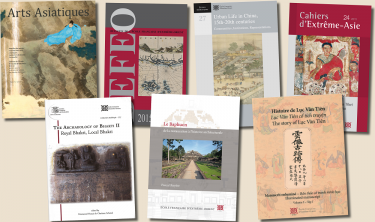 A succession of distinguished EFEO archaeologists and architects were responsible for the great restoration projects of Angkor: Henri Parmentier, Henri Marchal, Jean Laur, Bernard Philippe Groslier, Jacques Dumarçay, and many others. In 1992 the Cambodian government invited the EFEO to return to its former location in Siem Reap and reopen its Center there. Since then many new research and restoration projects have been carried out in collaboration with APSARA, the Cambodian organization responsible for managing the site, and within a system of international cooperation coordinated by UNESCO. The EFEO's work at Angkor is financed in large part by the French Ministry for Foreign Affairs. In 1992 the EFEO reopened the restoration sites that had been closed in 1975 under Khmer Rouge occupation: the Royal Terraces of Angkor Thom, including the Terrace of the Leper King and the so-called Terrace of the Elephants. In 1995 the EFEO resumed work on the temple-mountain Baphuon, the largest restoration site currently operating in Angkor. 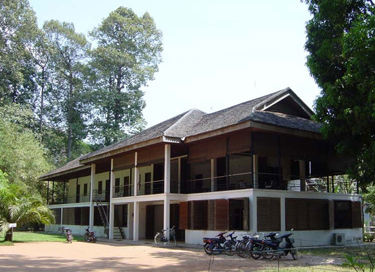 The Center also supports projects in anthropology and linguistics, and hosts many Cambodian and European interns at its worksites along with EFEO doctoral candidates and fellowship holders. Its facilities, comprising several buildings, host permanent and visiting research teams as well as international conferences and seminars. The Center also offers monthly lectures. A library including archival materials on the site of Angkor and the history of its exploration and restoration is open to the public. Informal presentation by Gérard Diffloth on: "Minority languages and ancient history in Cambodia"